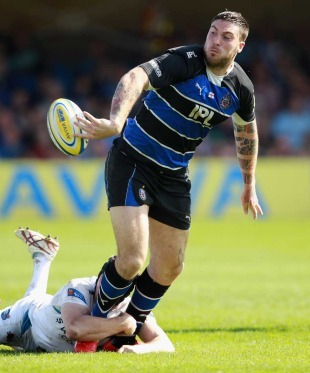 Bath's Matt Banahan is convinced new coach Gary Gold can re-ignite his international career. The 25-year-old utility back has not featured for England since their troubled Rugby World Cup campaign but believes Gold and his support staff of Toby Booth, Neal Hatley, Mike Ford and Brad Davis can inject new life into his game. "It's been amazing with Gary coming in - the culture they want, everybody's bought into it really quickly and that's showing by the way we're training, and now by the way we're playing on the pitch," said Banahan, who made his first outing of the new campaign in this week's third leg of the J.P Morgan 7s. "That's only going to benefit us as players, and as a squad, and as a team when we're playing in the Premiership again," he told the Bath Chronicle. "I just want to be playing well for Bath; obviously hopefully this will help me get a role in the starting 15 for England again. "I want to be week-in, week-out there and playing as well as I can. Obviously there are goals ahead, but I've got to be playing well for Bath and hopefully getting man-of-the-match displays. "Speaking to Gary, obviously we want me to be playing in the centres, but I've just got to enjoy it and, and I've just got to be playing well. I can use pre-season games to show the abilities I've got, in different positions, and I'm looking forward to playing the positions he puts me in. "In the off-season I wanted to make myself more agile. I was always able to get through games but I had a bit of extra timber that I needed to lose, and I've lost a lot. I just want to be giving myself the best opportunity to be playing the best rugby that I can. And if I can that it'll be brilliant. I wouldn't want to weigh myself now, after the 7s, to see how much I've lost." Reflecting on his side's 7s display that saw them book a place in next week's finale at The Rec as runners up to pool winners Bath, Banahan said: "My lungs felt alright -I was cramping a bit because it's always hard, playing a hard game for 14 minutes - we actually played two games back to back, resting for an hour then playing again," he added. "But I felt good and that's a good marker to set going into next week's finals - and into the first pre-season game as well. Pre-season has been really good. We've been in since 18th June - we're working hard and that's the best thing. "When you're working hard you see outcomes. We worked hard going into tonight and with a very young team the outcome we've got is getting to the final, and that's fantastic. Now we've got eight more days to look forward to getting out there in the final. It's massive given it's on home soil."